Monday night as I woke up, I again listened to occasional wind in the trees so once again did not expect there would be much morning photography worth spending time at in our camp zone. 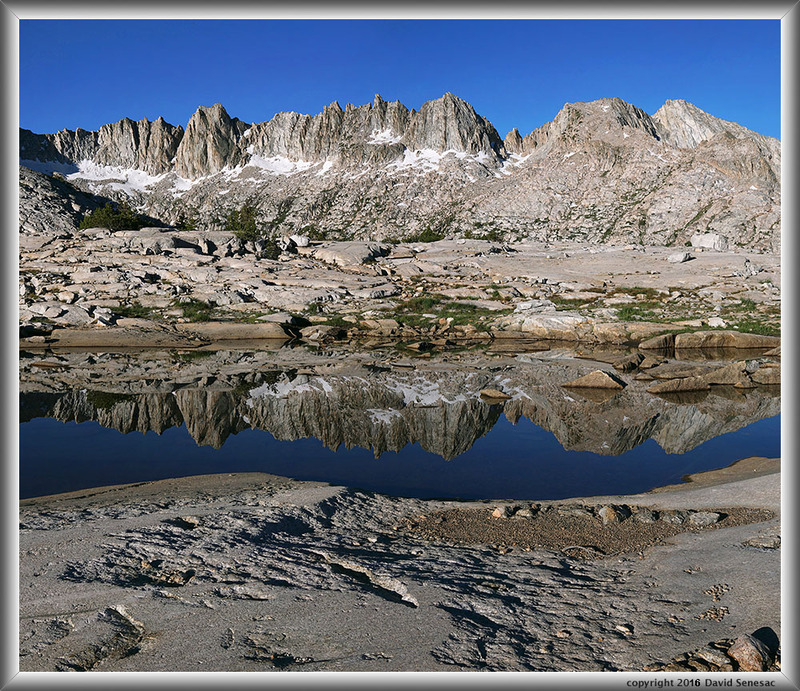 Thus with sunshine hitting peaks of Silver Spur to the west on Tuesday July 19, we decided to not waste time in moving on to our second base camp of the trip. By mid morning we had reached our chosen site on the eastern side of the Plateau of Ponds and began setting up our camp. With some decent light still shining on landscapes I did a tour of familiar nearby locations noting conditions and especially wildflowers. However any attempt to include water in frames proved to be futile as breezes did not let up. I returned to camp for a relaxed late morning then made an early lunch. 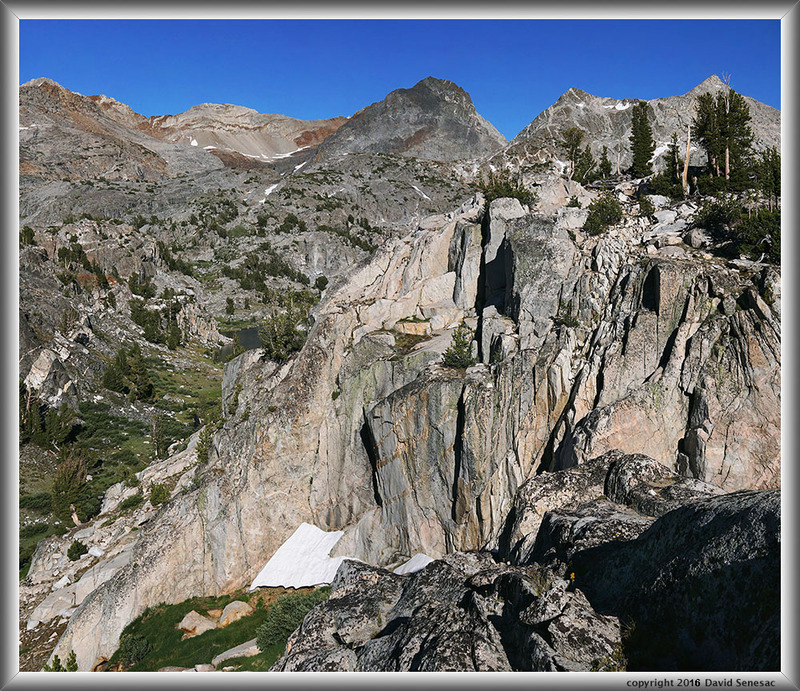 Joe and I decided on a long hike down into the stream canyon below at 10300 I referred to as Squeeterville, then up along the McGee Pass Trail to the spectacular meadow at 10580 I call Triassic Meadow from geology shown on my geological maps. 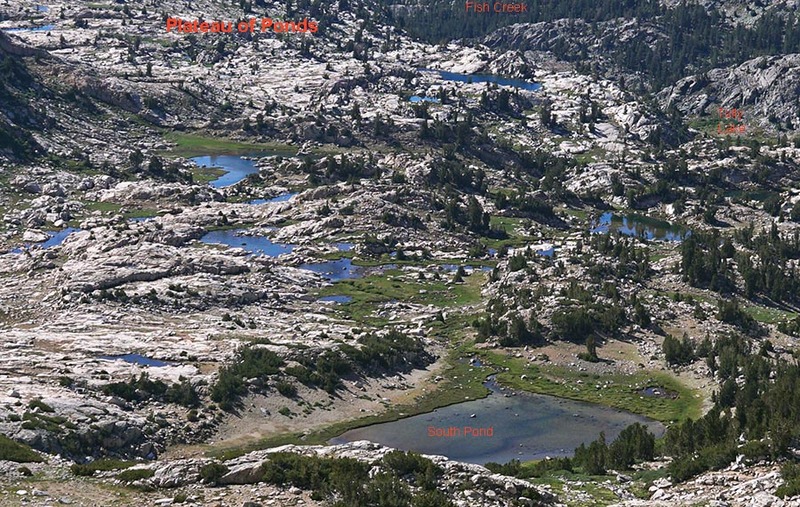 From there we would climb up to a location a group of us camped at in 1996 we call Flower Pond. That is another turf hummock pond not shown on the topo. Although modest numbers of mosquitoes were below the plateau along the creek, it was at Triassic Meadow where we found more than anywhere else during our 9 days. Though DEET kept them from landing and biting, there were enough flying around while I tried to work my camera that they became a nuisance and would show as usual black specs on captured digital images. During the trip I was stuck by at least a few mosquitoes every day and my wrist and upper side of hands was the usual place because after sticking my hands into water would not usually reapply repellant until they became an issue. For much of the trip I did not have repellant on at all, instead relying on all my clothing and headgear protection. Overall mosquitoes were a trivial nuisance on our trip though typical backpackers that wear their t-shirt, hiking shorts, baseball cap uniforms religiously would have been bitten a great deal simply because of inadequate gear that doesn't protect their skin and or refusal to use strong DEET on face and hands. There were lots of trout in the Triassic Meadow stream but no larger fish as we had seen a couple decades earlier. We wandered about the meadow areas then climbed along the headwaters stream up towards our old camp. Immediately numbers of mosquitoes decreased indicating they had concentrated about the meadow. I suspected the winds had blown many up from the Tully Hole and Squeeterville forested stream areas below. Quite fascinating was a very lush mossy seep stream area with lots of wildflowers. 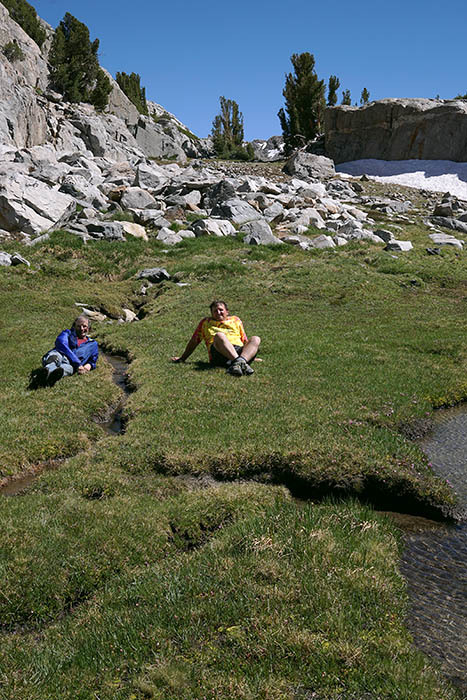 I had seen a similar seep stream in the nearby Convict Creek drainage above Mildred Lake a few years earlier. 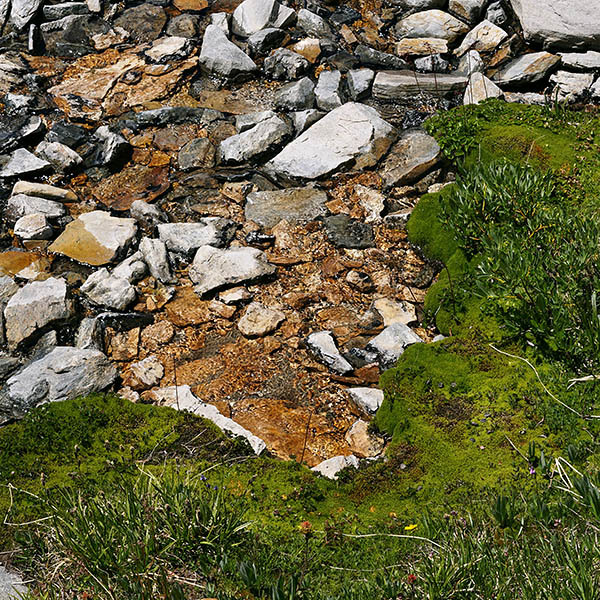 The water showed deposits of a rusty colored mineral, moss was brilliant green, and an interesting plant grew densely where the water flowed. We spent a couple hours marveling at little things in this wonderful area. Joe headed down to fish Tully Lake while I was intent on working Triassic Meadow late in the afternoon. Along the way with my 30mm Sigma lens worked the above 2 row 2 column view of Red Slate with patches of peaking red mountain heather, phyllodoce breweri, in the foreground. The heather was abundant on these still snow melting slopes with much at its peak color. The bright reddish purple petals quickly sun bleach, to less saturated color. Dropping down to the meadow, now about 5:30pm, mosquitoes rabidly attacked in larger swarms than a few hours earlier. I re-applied DEET that only kept them from landing as they buzzed around my head and camera with the latter causing out of focus black specs in my lens views during exposures. They were annoying enough that I declined to work the area as long as I might otherwise have done. 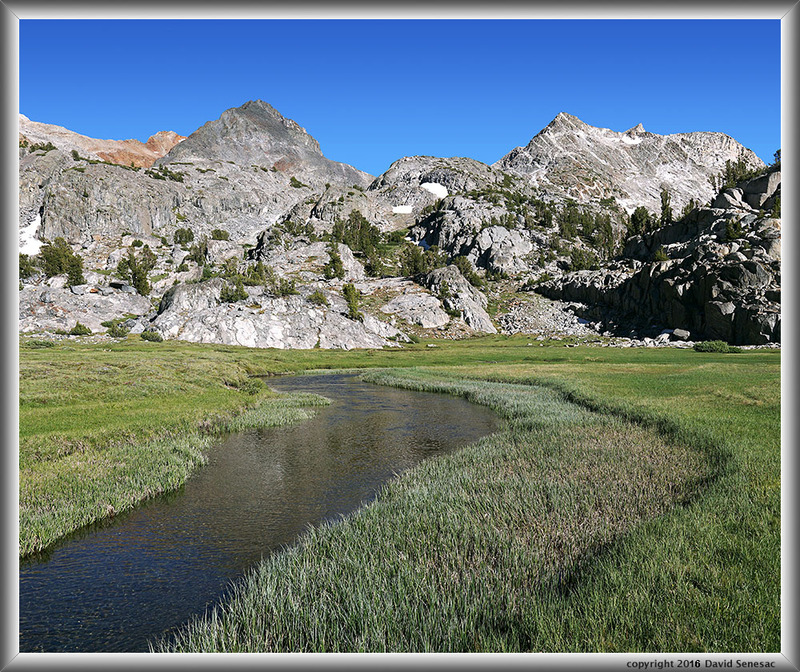 The image at page top PS09934-09946-2x1v shows a section of the Fish Creek in the meadow with colorful Red Slate magnificent behind within a deep blue sky. My last image above in the meadow is the view south up Fish Creek towards Red and White Mtn. Note the grasses within the stream channel present a superb cover for trout to hide in. 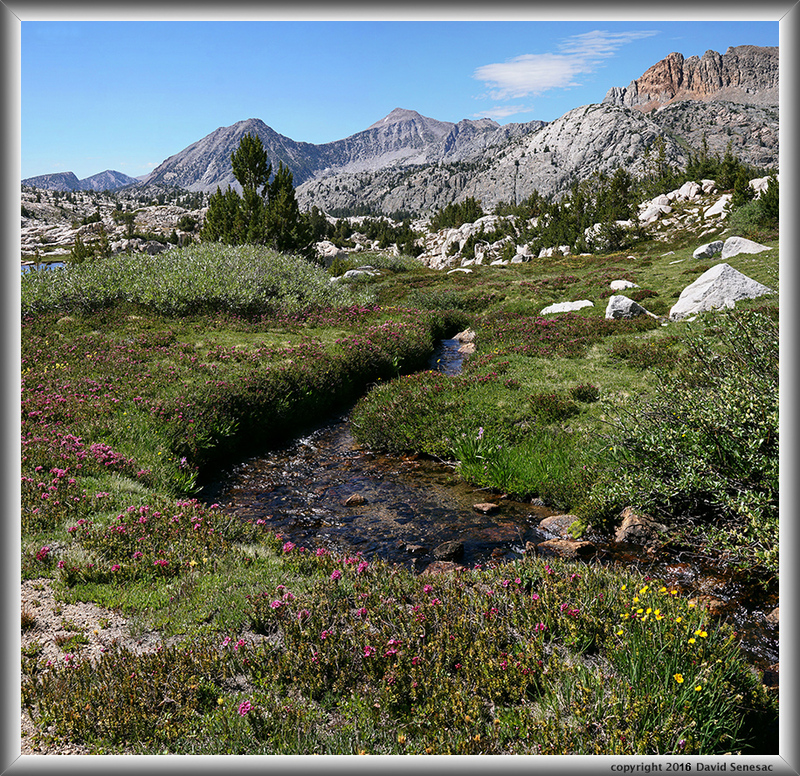 Few high country streams have much grass in their channels so the situation in this meadow is unique. More commonly this grass species grows down in quiet ponds. Back at camp we were able to lie out nekid on granite slabs without mosquitoes bothering us after dunking in a nearby shallow pond simply because it was out in a bright open exposed to breezes zone. Thus an indication of how varied mosquito conditions were over short distances. As dawn rose Wednesday July 20 it was apparent it would frustratingly be another breezy morning. 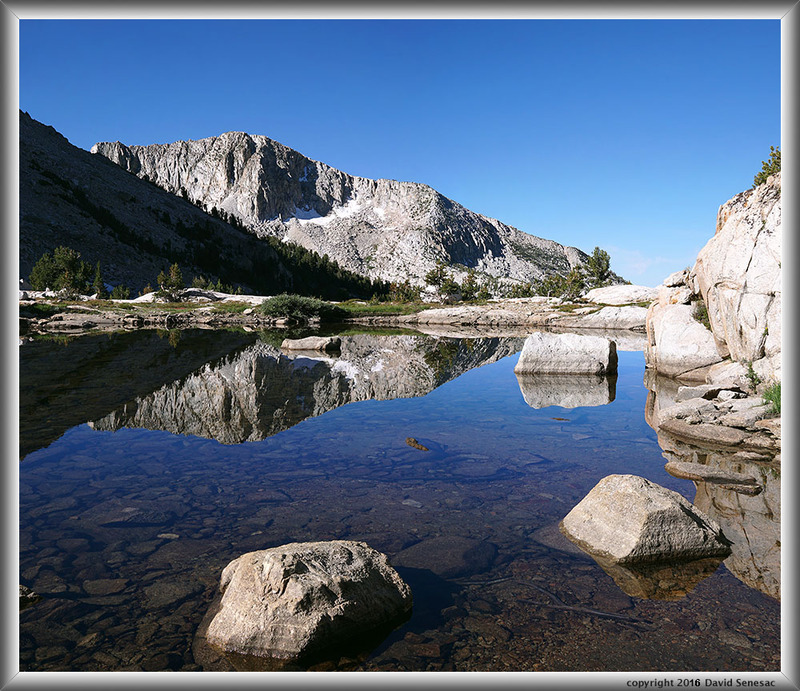 In order to make the most of it, we decided to day hike early up to remote Red and White Lake at 11014 feet that has a population of larger rainbow trout. 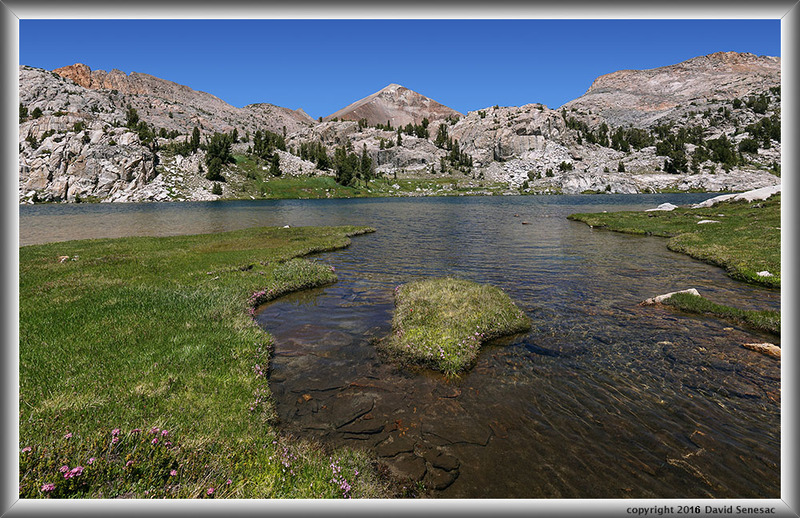 The lake cannot be visited by horses because the outlet stream runs through about 3/8 mile of moderate sized talus. On our hike we found the outlet stream close to the outlet was covered by a layer of snow. At the rockbound lake of dark geology, Joe was soon into fish. I took a turn using his rod and caught a nice fish I unhooked to freedom. As we fished, a couple of young backpackers looking like ants came down the snowfield at the far side of the lake after having come over Red and White Col from the Grinnel area. They were in for a dangerous effort to get around the lake as steep icy snowfields on the east side blocked the usual talus route. They managed to find a ramp a few hundred feet above the lake and came around. An hour later I met them down the canyon and listened to why they had made the mistake of coming over a pass known to be dangerous until August. I dropped down to Tully Lake and worked the modest image above that shows there are some nice landscapes at the lake despite the fact it is down in a deep hole. The rest of the day we had a pleasant time lounging around, eating, listening to music, and enjoying our area. I did manage one nice image about 6pm with a colorful view up the rugged Tully Lake gorge with a bit of the lake plus Red and White Mountain in the background. Late afternoon the sun once again descended into unseen brown murkiness in the west that prematurely ended any chance of late photography. I had one more morning on The Plateau of Ponds. I could only hope the days of breeziness had finally pushed east. Indeed as I got up to attend to nature's call during the wee hours of Thursday July 21, dead calm was evident as sounds carried to far distances. Thus well before the sun rose I was outside my tent heating up water for hot chocolate and soon rambled off to pond locations for reflections of Silver Spur. The image I worked first, a rocky pond came out nicely. However the second subject above of a small shallow glacial polish pond was even better. I went over to a familiar pond I call the Aster Pond and worked the above image. However at this early time of wildflower succession there were no alpine asters blooming but rather dirty socks aka bistort, polygonum bistortoides , and a few Peirson's paintbrush. Nicely, I could position my tripod so the dirty socks background was the contrasting dark pond bottom. Behind the pond rose a few scattered whitebark pine, pinus albicaulis, in the 100 or so foot space between this pond and the edge of Cotton Lake. Just above the dirty socks one can make out a band of yellow pine pollen in the water much of which blew in during the previous few breezy days. I worked a couple more images that came out nicely and then about 8:30am a constant up canyon breeze came up that ended my reflection work on this trip. Returning to camp, Joe and I decided to cut short an optional plan to stay into the afternoon and instead pack up and move up to the South Pond area where we would make lunch and linger till early afternoon when I could work a flowery stream area I'd noted on our route in that is the image above. 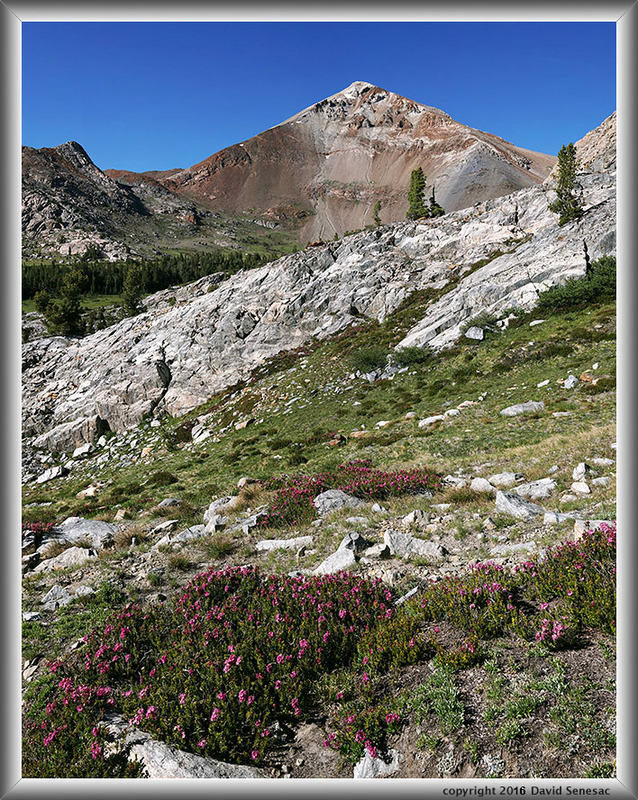 At 3:30pm it was time to make the 700 foot climb up and over Shout of Relief Pass, that is on Roper's High Sierra Trail cross country route. I previously brought a group over that pass from Grinnel in 1996. Up we went slowly stopping frequently and a bit before 5pm we had topped out. It was a good spot to take a picture of the overall Plateau of Ponds the below of which is a crop from a wider image that include Ritter and Banner in the background. On the south side of the pass made this image below looking south. From the pass one drops directly steeply down towards the lakelet below. With a heavy pack one needs to carefully zigzag down the sand, turf, and rock soil. The no name water below on a bench above Rosy Finch Lake is a pretty lakelet with a northern sandy beach covered with pink hued alpine laurel much like Bighorn Lake. The water has depth and there are level places to legally camp. We continued down to Rosy Finch that is a puzzle both to descend to and as to where one might legally camp given shoreline cliffs and slopes that rise quickly from its waters. We found excellent tent spots just downstream in the lee of stunted whitebark pines that conveniently also gave us good access to a nearby snowmelt streamlet. Although Joe brought a water filter along, we spent the whole trip getting our water from small safe streamlets that one tends to still find mid July but not by mid August. A bit weary we enjoyed dinner and as the sun set retired into our tents. Friday July 22 our plan was to dally a bit fishing Rosy Finch then make our way down to Mott Lake where we would dally again before rambling down the creek trail to a familiar slab area a few miles below that brought us within morning striking distance of the ferry dock at the end of Edison Reservoir for the 9:45am pick up. And fish I did, quickly catching a few rainbows that I inverted the hook with my long nose pliers to flop off back into the cool deep waters. When the sun had risen enough to shine down into the canyon below, I left Joe to continue fishing awhile while I grabbed my already packed up backpack and made my way down to flowery areas below where I had a chance to do some close-up work since the morning air was actually calm unlike most days of this trip. 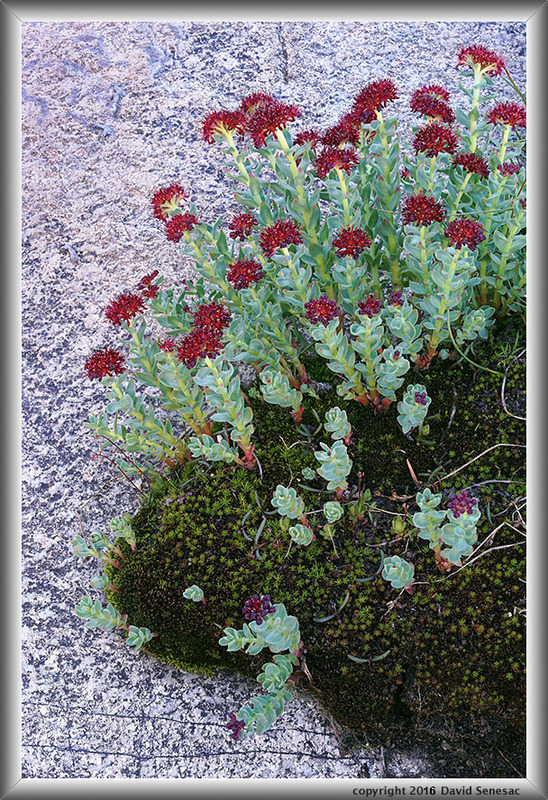 I'd been looking for a good western roseroot aka rosy sedum, sedum rosea, subject all trip but the constant breezes had left me letting them alone. I came across the above spectacular subject still in shadows where a snowmelt stream had just recently dried up and went about carefully setting up my 60mm making sure I could stack shots to capture the whole frame in sharp focus. Another two species on my radar were the two heath family species that often grow together. 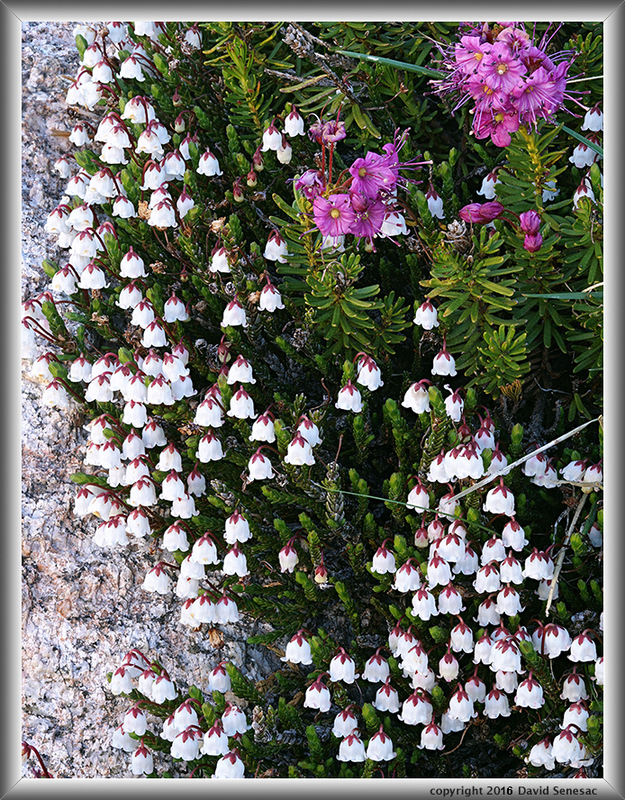 Not far from the roseroot was this nice duo above of white heather, cassiope mertensiana, with its tiny bells and red mountain heather, pyllodoce breweri, again beside the dried granite stream channel. 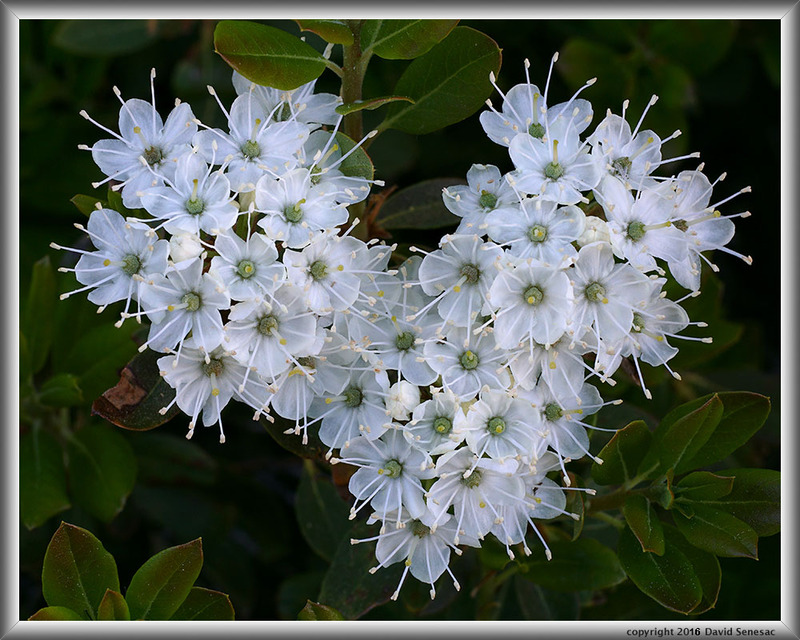 I wandered down the slope and found yet another member of the heath family, the above Labrador tea, ledum glandulosum, with an interesting V-shaped bloom. 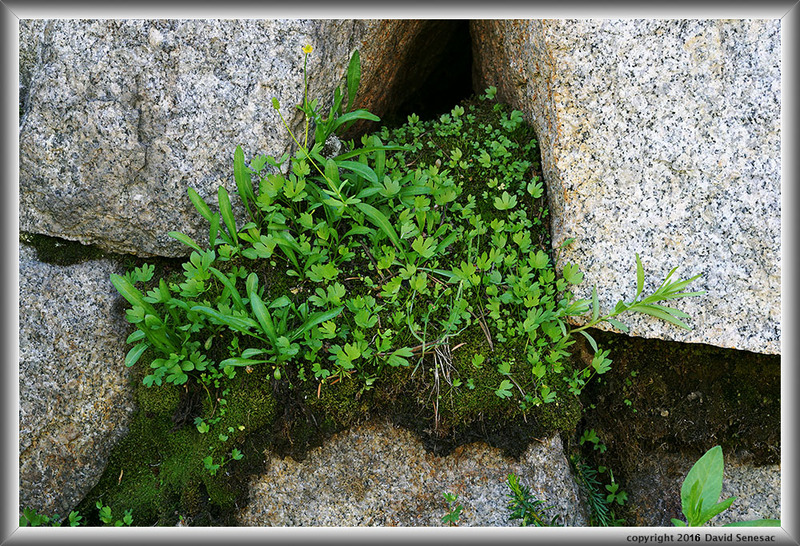 This next image above was on the shaded side of a granite boulder where moss growing in cracks had a colony of just rising lushly green herbs one of which had an unidentified species with a yellow flower. 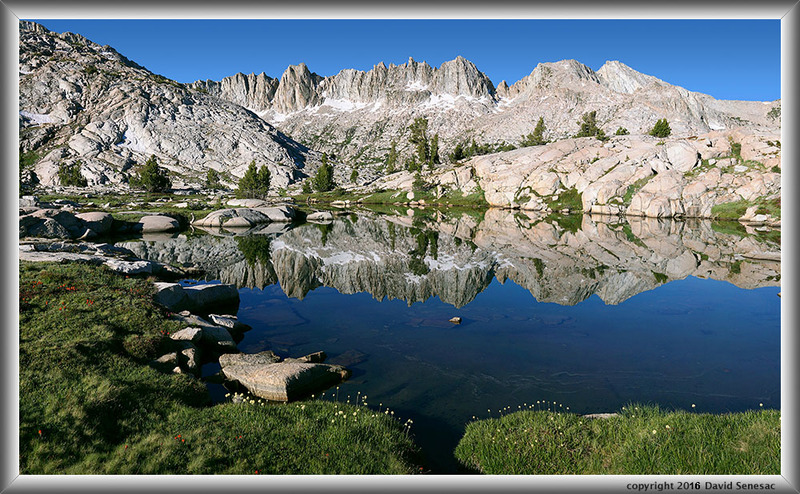 The topos shows a pond at 10350 in this flowery valley that I investigated and shot this modest reflection down canyon towards peak 11455 that leads to the Bluejay Lakes. The shadowed tree line at frame left provides a nice graphic for the reflection. A bit later Joe joined me and we continued down to Mott Lake where Joe fished awhile and found out the lake now contained some nice golden trout. Then it was a long ramble down down down to a slab area we had camped at once before. We made camp and enjoyed finishing off our snack foods while playing in the not so chilly stream waters. We both were amazed at how few mosquitoes were encountered a week after we had hiked up when they were numerous. Thus were able to lay outside with much bare skin showing until late in the afternoon when minor numbers were about. Did the winds blow them all up and away into Nevada? Saturday morning we uneventfully got up at sunrise and rambled down to the ferry with an hour to lounge. Although I managed to image some fine images, if I had the luck of less breezy mornings and clearer air down in the valleys east and west of the Sierra, the amount of such images would have been far more.